I realize this is no revolutionary recipe. Heck, it's not even a recipe. It's more of a sanity strategy if nothing else. This Mama needs plenty of sanity strategies to make it through the day in one piece. Luckily, the other night when I was feeling overly tired and unwell I got myself into bed at 7:30 and fell fast sleep. In my stead, Dada had an evening of fun and adventure with the littles in the kitchen. 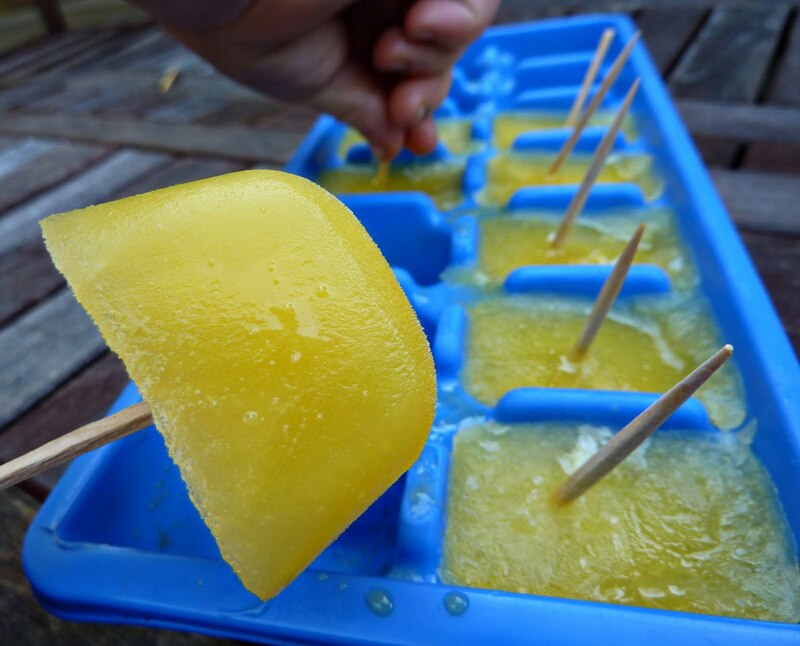 These orange juice ice cube pops were just one result of the troop's freewheelin' late night capers. The concept is simple. Yet, somehow, I have never done this with my children in all my years in my role as mother. I suppose it takes Dada and his freewheelin' ways to come up with such an exciting plan for morning joy. Pour your favorite juice into an ice cube tray. Cover with plastic wrap so the toothpicks remain upright. Insert toothpicks. Wake up in the morning and dig in. Mama is still in bed trying her darndest to sleep in, if there is such a thing with young children in the house. She hears the pitter patter of little feet in the kitchen. Dining room chairs are being pulled over the hardwood floor to the freezer making a highly undesirable noise at such an early hour. Little hands reach deep in to the back of the cooler box and grab the little blue tray of delight. 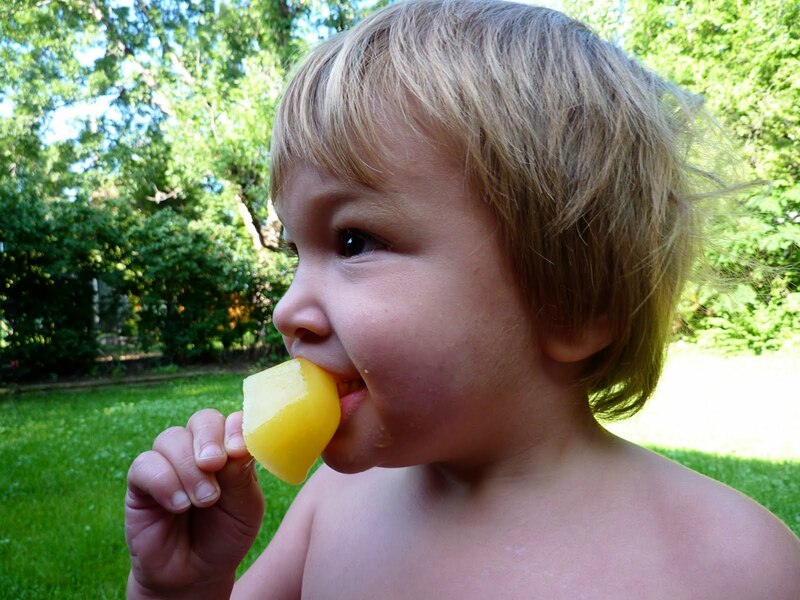 They start in on the ice cube pops. Everything is quiet. For minutes. For tens of minutes. Pop after pop and the children are quiet. And delighted. Mama nuzzles her head under the covers for just a few minutes more. All is well with the world.